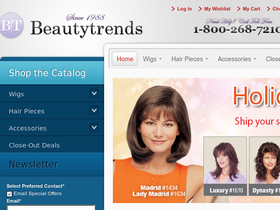 Shop Beauty Trends online at BeautyTrends.com for the largest inventory of wigs and hair pieces on the internet. Beauty Trend's Revlon wigs include Perfect Fit and Hair Magic, while from Adolfo they have Aire-lite, Hand-tied Hairpieces, Wiglets, and Large Cap Wigs. Short, long, red, blonde, curly, straight - whatever look you want, BeautyTrends.com will have the wig for you. Save on your next purchase from BeautyTrends.com with BeautyTrends discounts, BeautyTrends coupons and BeautyTrends savings found here on 58Coupons.com. Enjoy free shipping on orders of $100 or more from BeautyTrends with this promo code. Follow this link to start shopping. Visit Beauty Trends today to save 30% on wigs and hairpieces. Follow this link and discount will be applied at checkout. Buy any of the new beautiful styles from BeautyTrends.com and receive a free Revlon folding brush and wig stand. Click link. Head on over to Beauty Trends where shipping is only $4.99 for any size order with this coupon code.